No-one is in agreement with how the place Marylebone is pronounced – Marleybun, Marrylebun, Marylebone, Marrybone – and this indecision is echoed in the early newspaper reference to the first pupils. Mary Ann Fiske, it tells us, lived in ‘St. Mary-le-bone’ at the corner of ‘Marybone-lane’. In the space of six words, it is spelled in two different ways! Marylebone Lane, one of the original streets of the Marylebone district, runs from Oxford Street in the south to Marylebone High Street in the north. Its sinuous shape contrasts strongly with other streets laid out in a grid pattern, a legacy of their being developed together. The lane originally followed the course of the River Tyburn. 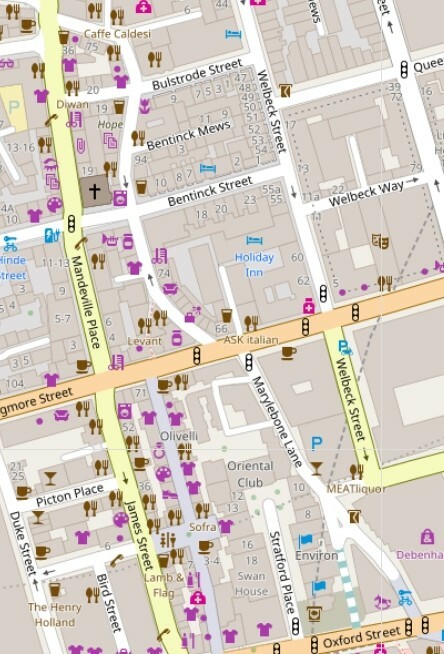 The modern street map shows the contrast particularly well and gives it today a charm missing from its neighbours. Marylebone gets its name from a church dedicated to St Mary built on the bank of a small stream or bourne, called the Tybourne or Tyburn. The church then became known as St Mary at the bourn – or Marylebone. The Ty- prefix is derived from Anglo-Saxon teo a word meaning boundary. Watercourses were often used as boundaries between districts, just as gallows were often erected beside them. The name Tyburn is probably most often recalled as a place of execution near to where Marble Arch now stands. The village of Tyburn is recorded in the Domesday Book and stood at the end of what is now Oxford Street, formerly called Tyburn Road. What is now Park Lane was once Tyburn Lane. That should cause a lot of confusion in a Monopoly game. The earliest written mention of the Tyburn dates back to around 785 AD. 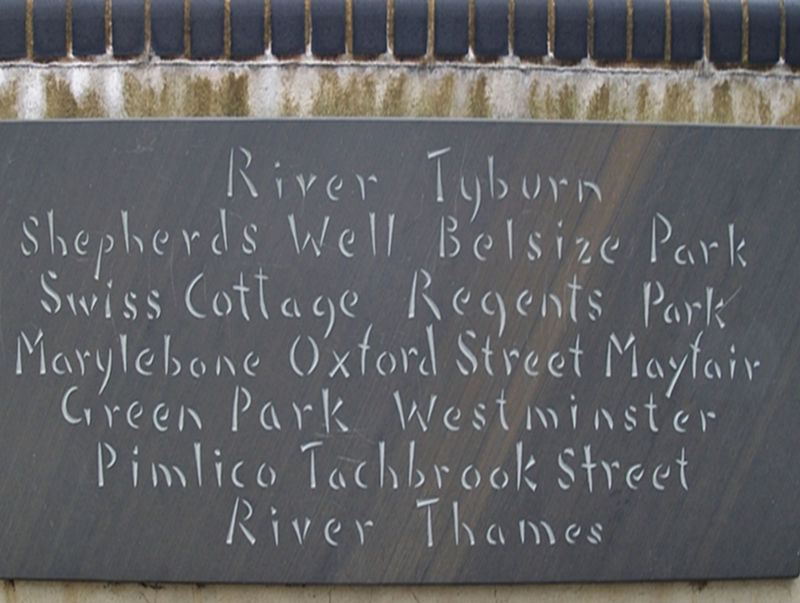 The brook that is the Tyburn is not be confused with Tyburn Brook which is a tributary of the Westbourne and not connected to the Tyburn River! (http://www.londonslostrivers.com/river-tyburn.html) It’s hardly surprising non-English people find the British way of life confusing. The R. Tyburn today mostly flows underground and is connected into Bazalgette’s great sewerage system. It runs along a pipe in Baker St station and through an open rill near Grey’s antiques (complete with goldfish!). It also flows underneath Buckingham Palace before it finally emerges in an outfall at the Thames. Like the ancient village of Tyburn, Marylebone originally ‘was a small village, nearly a mile distant from any part of the metropolis.’ Daniel Lysons, ‘Marylebone’, in The Environs of London: Volume 3, County of Middlesex (London, 1795), pp. 242-279. British History Online http://www.british-history.ac.uk/london-environs/vol3/pp242-279 [accessed 5 March 2019]. 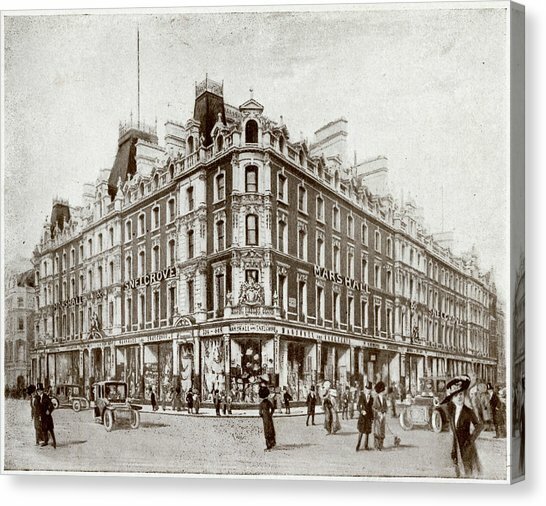 There is something rather deliciously cyclical that ‘the future Marshall & Snelgrove’ later became Debenhams after Marshall & Snelgrove ran into financial difficulty in 1819 and now, one hundred years later, Debenhams itself is in financial difficulty! Where exactly on Marylebone Lane Mary Ann Fiske lived is an unknown. We are told it is ‘Stationer, corner of Marylebone Lane’. In a roadway that curves and winds its way south, precisely which corner of many is unclear. There is a later reference to a stationer, Henry Somerfield, who had Nos 15-17 Marylebone Lane built for him. However, these buildings, demolished in 2010, were built in 1890-1 so long, long after the Fiskes were there. One of four daughters of Jonathan and Prudence Fiske, Mary Ann – usually referred to as Ann – was born on 16th October 1782 and baptised on Dec 1st of that year. 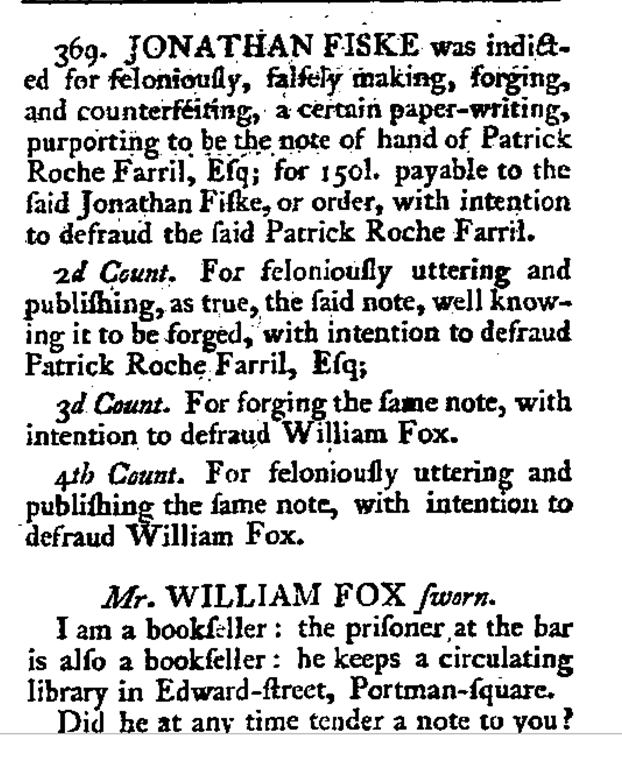 He was found not guilty in May 1781. In July of the same year, he published an account of the trial in which he not only made clear his opinion of his accuser but cast aspersions about him which would have lawyers licking their lips today – and maybe then too. What is interesting is that this was printed for J Fiske but also for four other booksellers which implies that they were a mutually supportive group. 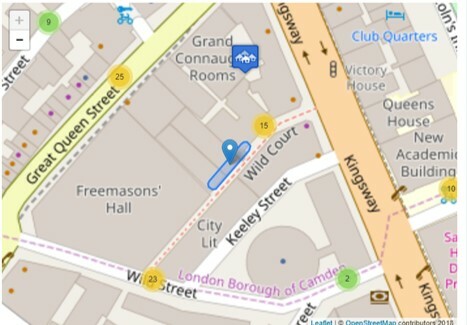 Fiske’s address is given as Edward St, Portman Square at this time but by the time he was applying for Mary Ann to attend the School, the family was in Marylebone Lane. Had they moved because of indigence? 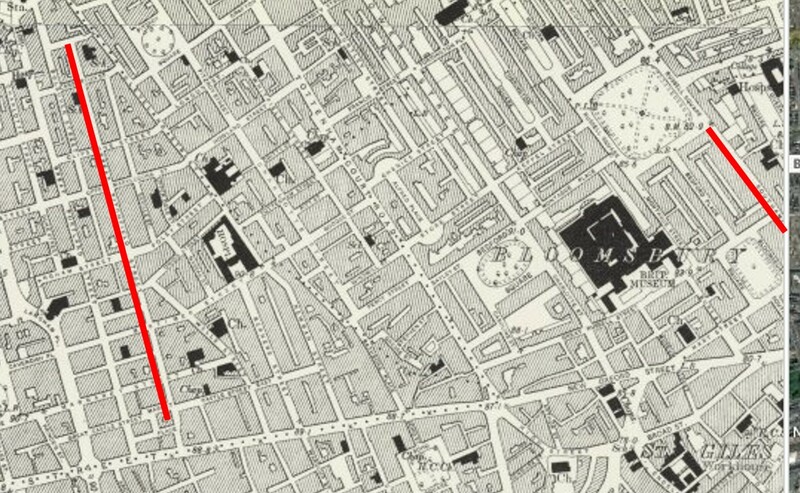 In 1828, Prudence Fiske, Jonathan’s widow, is listed as a bookseller in Wigmore St (next to which Portman Square can be found), so it is unclear whether they kept moving or had several premises. Between 1784 and 1811 Jonathan paid rent in Marylebone Lane and if this were one of several ‘outlets’, one has to assume a lack of indigence, but the fact remains that during this period he applied for his daughter’s attendance at the School and was successful in that application. By 1799, Jonathan had again achieved respectability – if he had ever lost it – when he was appointed foreman of the jury, his name being cited in a coroner’s inquest of that year. Mary Ann had eight siblings although the last two of these were born after she was attending the School in Somers Place East, so perhaps it was the large size of the family that made her eligible. Unfortunately the Rough Minute Book, which lists details of ten of the candidates for the first admission, does not include any reference to Mary Ann Fiske so we are not party to the thinking behind her inclusion. Unlike the last Mary Ann this blog focused on – who had a rather unladylike turn of phrase it would appear – Mary Ann Fiske seems to have passed her time at the School blamelessly. She did leave ‘before her time was due to expire’ however. In 1794, we are told that ‘In consideration of the peculiar circumstances of this child’ she was returned home with the sum of £10 and no further claims on the Charity. Her father was asked to collect her. This was a considerable sum of money for the time and is an indication that she was not leaving in any disgrace, for which she would have been dismissed summarily with no payment. A month later, her mother wrote to the Committee expressing gratitude and in this communication lies a hint of the reason the child left. Her mother wrote that ‘Ann’s health seemed very precarious for since she had been at home she had had frequent relapses of the disorder with which she was afflicted’. We will never know what affliction she was suffering from in 1792. However, lest one might imagine that a burial record would be the next document found, it might come as a surprise to discover that Mary Ann Fiske actually died in 1862, some 70 years after she left with an affliction! In fact many of the family lived to ripe old ages. Prudence (the mother) was 96 when she died, Mary Ann 82 and Thomas Hammond Fiske, the brother whose home she shared at least between 1841 and 1861, was 83. 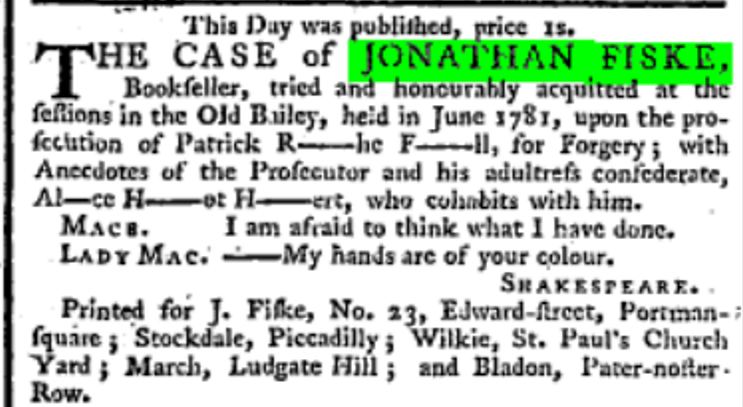 Jonathan (the father) died in 1823 in Marylebone and was buried on the 4th February (the ditto, ditto in the record). Although, of course, we cannot be certain this is ‘our man’, it should be noted that the 1841 census does not find him with the rest of his family. Furthermore, Prudence is listed as a bookseller at Wigmore St in the 1828 Pigot’s directory which implies that it was a family business that Prudence took responsibility for after her husband’s death. The 1841 census did not record marital status so we do not know if Prudence was widowed but it seems likely. She is recorded, as are two of her daughters, as ‘Ind’. It might, however, explain why the Fiskes upped sticks and moved to Portsmouth if the head of the family had died. 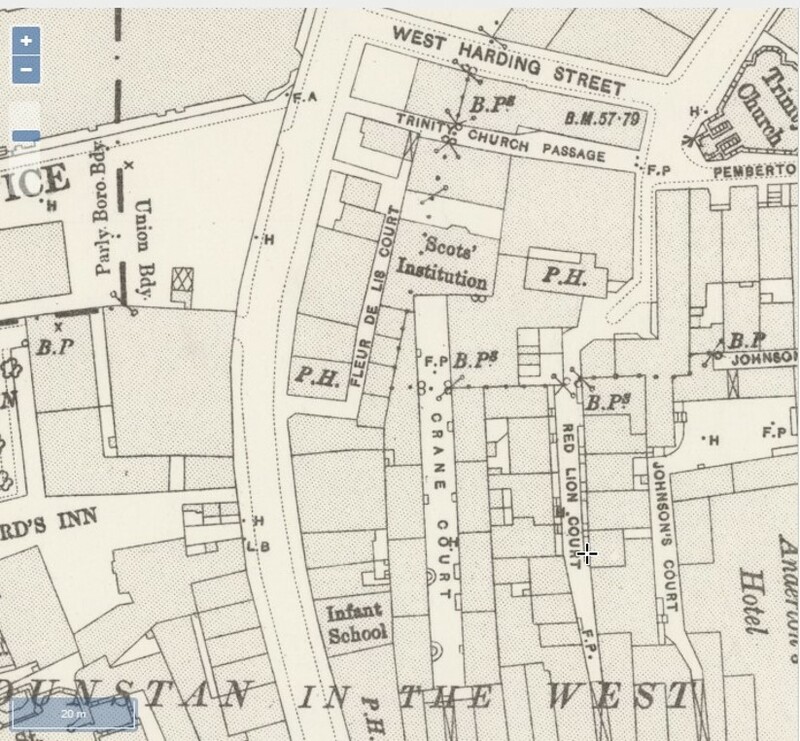 Mary Ann is sharing the household of her brother Thomas Hammond Fiske and it is in Portsmouth on 4th June 1862 that she dies and is buried, her address being given as the High St. So from Marylebone Lane to High Street, Portsmouth, her life is mapped out albeit with tantalising gaps that one longs to fill! Two of our first pupils hailed from East London within sight of the river. For one, her home in Shadwell was not just in sight but in sound and smell too! Mary Ann Ruscoe, daughter of Thomas and Mary, lived at 45 Bell Wharf. 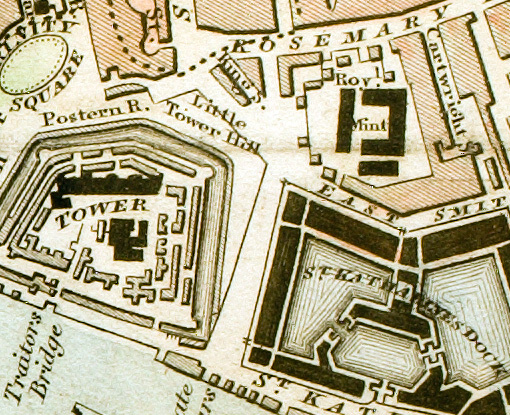 Rocque’s map of 1746 shows Coal Stairs (on the left hand side of the shaded area) whilst the stairs on the right, Lower Stone Stairs, became Bell Wharf Stairs. But Bell Wharf itself does not appear on maps. One has to assume, however, that the eponymous stairs led to or from Bell Wharf. 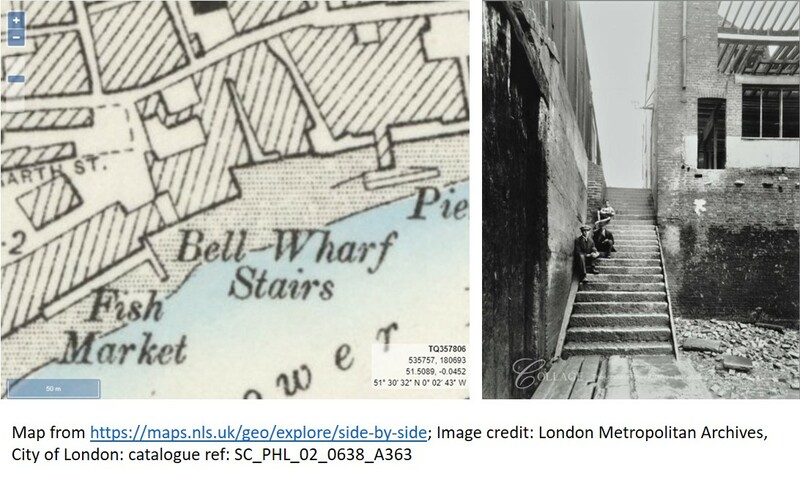 The photo (from https://alondoninheritance.com/tag/shadwell) is Bell Wharf Stairs from the Thames foreshore. It was an area redolent with the ‘specialist industries required in the eighteenth century to provide the supplies and services needed by the thousands of ships, schooners and colliers …’ (2) including ropeworks, cooperages, breweries and taverns. In the case of Mary Ann’s father, his trade of pipemaker, whilst not exclusive to sailors, no doubt gave him a business with the mariners arriving and departing. The ‘certificate of Register’ relates to Thomas’ registration as a Freemason rather than Mary Ann’s baptism. The reference to ‘Mr Dennison’ – P R Dennison, Governor of the School – is an indication of who supported the application. Now the sharp-eyed amongst you will have spotted that we have a discrepancy in dates here. And there’s more to follow! Mary Ann joined the other girls in the house at Somers Place East where everything presumably went swimmingly until 1793. On 27th December of that year, the Matron reported that conduct had been poor, with language ‘very obscene and improper’. The phrase to swear like a fishwife may be apt here. Quite possibly Mary Ann had been exposed to some fairly fruity language from her upbringing near the docks. We do not know what she said that the Matron thought ‘very obscene’ but we can guess that Mary Ann realised she had probably overstepped the mark linguistically and produced a defensive countermove. She announced that she was older than everyone thought as ‘her Friends had put her a year back’ to make her the proper age for admission. The baptismal register was sent for and compared with the documents produced by the parents, whereupon it was discovered that the presented documents had been forged. The girl’s baptism was shown to be 8 August 1779 when she was 24 days old and not 1780 as claimed (and then written as 1782 in error just to compound it). The Committee therefore recommend to the General Court that from the extreme misconduct of Mary Ann Ruscoe and the dangerous tendency of her vicious and immoral conduct among the other girls together [great heavens – what had she done??] with the imposition practised on the charity by her parents that she be immediately dismissed and returned home to them. Despite this condemnation, it is later recorded that she was apprenticed to Mrs Andrews of Tichborne St [now Glasshouse St] and it seems strange that an apprenticeship – and the costs thereto – would be found by the School given the shadow under which she apparently left. She would have reached school-leaving age in July 1794 and so would have been apprenticed then but one has the impression that Mrs Andrews probably wasn’t informed of Mary Ann’s previous behaviour! Of Mary Ann’s post-school, post-apprentice life, little can be ascertained. There are two possible marriages. Neither are in Shadwell which means one is interpreting generally and possibly wholly inaccurately. Even taking these into account, the 1841 census, the first in which individuals were named, doesn’t give any entries that one could say ‘Yes, that’s her’ so it all remains unsatisfactorily vague. We are left with a set of parents not above fact-massaging to get an advantage and the unholy impression of a child who had a few unsavoury turns of phrase in her armoury and wasn’t afraid to use them! 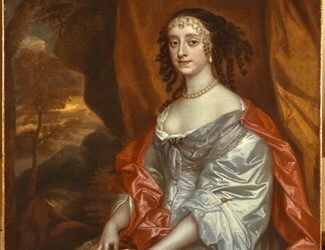 So let us turn aside from cussing and look at Frances Sansum, the other ‘Eastender’ who hailed from East Smithfield St. This, unlike Bell Wharf, does still exist but the modern version looks nothing like the one the Sansums would have known. What is today East Smithfield leading into The Highway was previously Upper East Smithfield leading to St George St. 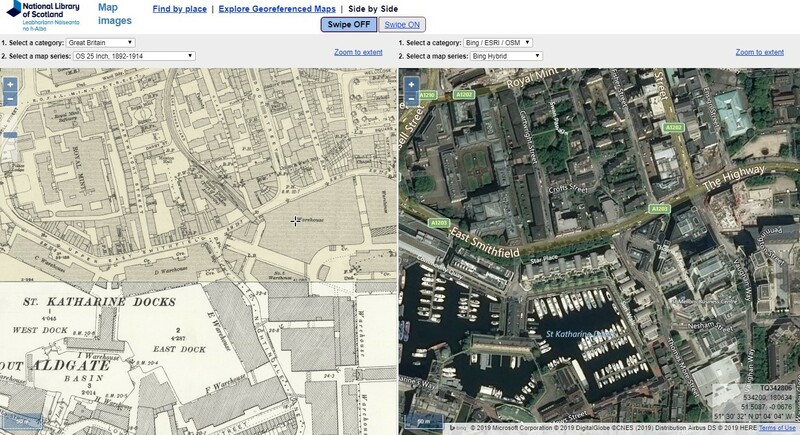 The 1833 Schmollinger map shows the street skirting the edge of St Katherine’s docks. 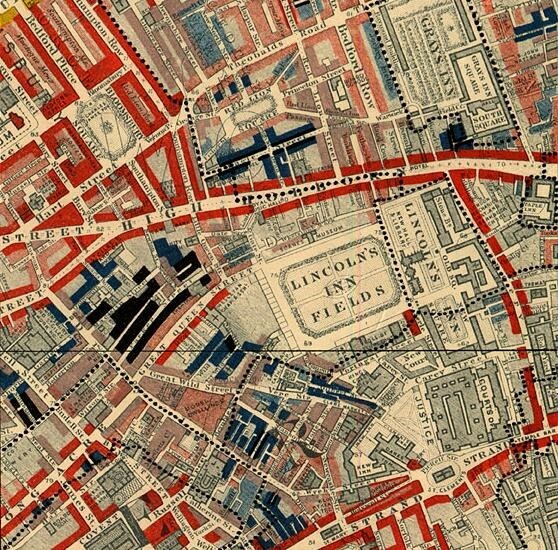 Section of “Improved map of London for 1833, from Actual Survey. Engraved by W. Schmollinger, 27 Goswell Terrace” showing the location of the Royal Mint. 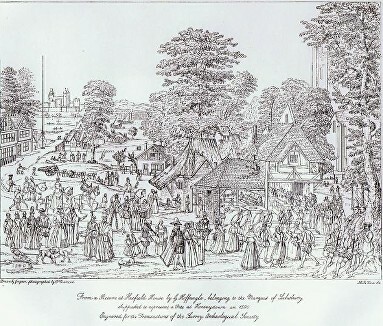 The area was most notably used in the fourteenth century for two cemeteries in which London victims of the Black Death were interred: up to 200 people a day, in mass graves, stacked five deep. The docks were constructed in 1828 and so would not have been there at the time Frances was resident. Presumably what she saw then in the area related to St Katherine’s Hospital. 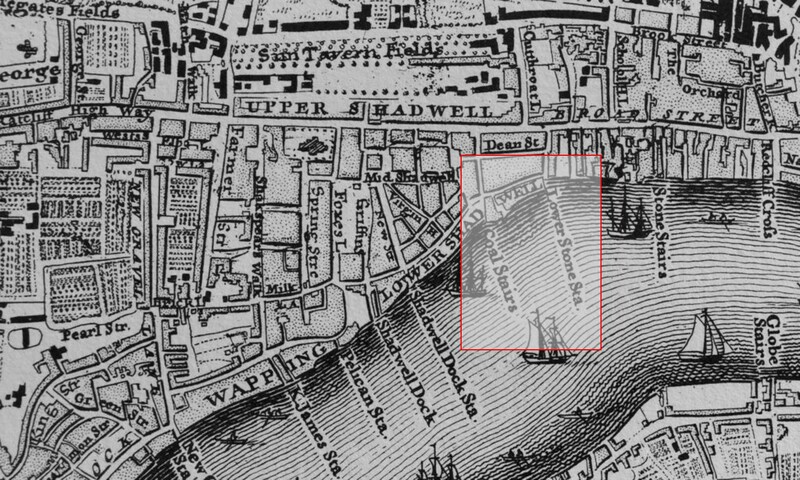 This 1750 map shows the area pre-docks. To the right, is what looks like a market garden area. Between 1800 and 1810, this became part of London docks but today it has once again been reclaimed as land for housing. So clearly this is an area of much change. The modern East Smithfield would leave Frances Sansum completely bewildered! Today it is a busy but nondescript stretch of road between Ratcliff Highway and the Tower of London and the London Marathon runs down it. 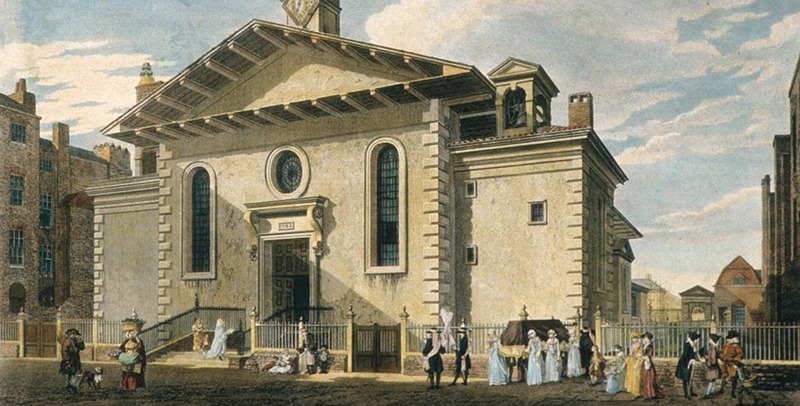 Frances had been christened on 25 December 1780 at St Botolph’s, Aldgate Without, the name indicating that the church lay outside the City Walls. Her parents – Isaac and Elizabeth – had married in 1774 when he was 27 and she was 18. Frances was one of three daughters born to the couple but, sadly, the only one who did not die as a baby. By trade, Isaac was a hosier, someone who made, or distributed, foot and legwear. During the second half of the 18th century, changes in fashion and competition from the cotton industry meant that the hosiery industry began to decline. Perhaps because of this he moved into apparel generally. In January 1786 we find ‘The Petition and Appeal of Isaac Sansum of the Parish of Saint Botolph Aldgate’ to appeal against a £20 fine ‘for having sold a Pair of Gloves not having a Stamp Affixed there to’ (London Metropolitan Archives LL ref: LMSMPS508060005). In https://rmsghistoryextra.wordpress.com/2019/03/20/court-report/ we saw how Pitt’s tax on gloves may have caused hardship to the father of Ann Martin. Now we have another father caught out by political machinations. The hefty fine must have created a problem for the family finances. Isaac’s name on the appeal. However, in Frances’ case, her recommendation as a pupil, supported by Dr de Valangin and 11 more Governors, may be as much about her as her father. The Rough Minute Book records that she ‘has lost a leg’. At no point are we ever given any further information about how this had happened (e.g. accident, disease or congenital) or whether it created problems for her mobility. The subject is only mentioned one other time. When she was due to leave School, her mother expressed doubt that a suitable apprenticeship would be found because of the child’s missing leg. In 1792, a problem arose concerning the child which appeared to have nothing to do with leglessness – at least it wasn’t mentioned so we presume not. In September, her Friends applied for Frances to have leave of absence. If ‘they’ (in reality likely to be her mother as she is the only parent later mentioned in School records) gave a reason for this application, it was not recorded. The reply from the Committee was decidedly frosty. Leave of absence from the school ought not to be granted to any child on any pretence [my italics] whatever as the perseverance of good order in the school and the health and morals of the children especially depend on their never being suffered to go home to their Friends whilst under the protection of this Charity. Furthermore, if her Friends applied again, Frances would be instantly dismissed. They didn’t. Now the word ‘pretence’ above is interesting. Did the clerk mean to write ‘pretext’ which would fit the sense here? Or is the word ‘pretence’ a veiled indication of fraud? And if the reaction seems harsh, it should be remembered that a girl, once accepted, had everything she consumed paid for (food, clothing, education, living expenses) and received a good start in life along with gifts of clothing and money with which to depart the School. The Charity wanted to be very sure that no-one was taking advantage of them. Frances eventually was found a position with Mrs Dorcas Grives of Fair St, Horsleydown, a schoolmistress. This street was so named as a fair used to be there (very literal our street namers). Where Fair St joins Tooley St is a Grammar School where Dorcas Grives was listed as a Governor in 1825. By this point, it is likely that Frances had moved on. She remained south of the river apparently for the rest of her life and may have been trained as a teacher by Mrs Grives but we do not know that. In 1841, she is described as ‘independent’, a phrase indicating she had her own money. She was living in the gloriously named Baalzephon St, Bermondsey (later Weston St). By 1851, she was in Kynaston Row, Bermondsey, described as an annuitant which would clearly indicate that someone or some institution was providing a pension. She died in 1857. 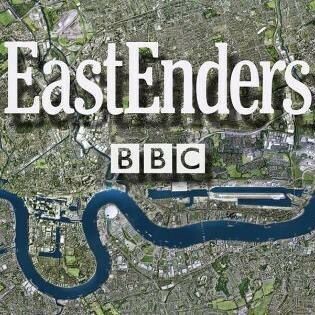 And with her burial record we conclude the story of our two Eastenders. Sibella Proctor, Ann Martin and Charlotte Richardson, three of the first pupils in January 1789, all lived in Courts. To wit: Black Swan Court, Wild Court and Flower de luce Court. Of these, only one still exists – Wild Court –immediately behind the Library and Museum of Freemasonry and United Grand Lodge. A map of 1750 sort of shows Wild Court, on the edge of one map and the next, showing that the propensity for the places you want being right on the fold of gazetteers is not a new phenomenon! Wild Court ran off Great Wild St with Little Wild St (now renamed Keeley St) running parallel. 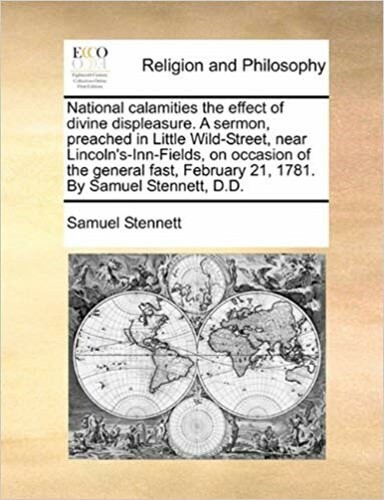 In 1781, a sermon was preached in Little Wild St.
Dr Samuel Stennett, a dissenting Baptist preacher, ministered to the Little Wild Street church. The map below, although somewhat later in date, shows the Baptist chapel. His sermon was made on a day which had been declared a public fast. Unfortunately ‘references to public fasts are relatively scarce in public records’ (Religion and the American Civil War: Miller, Stout & Wilson, 1998) and the same must apply to UK as not a trace can be found to explain why February 21 1781 was a public fast day. For those with plenty of food it perhaps had more impact. For the less well-off, for whom a fair few days might involve fasting, the impact was less great. 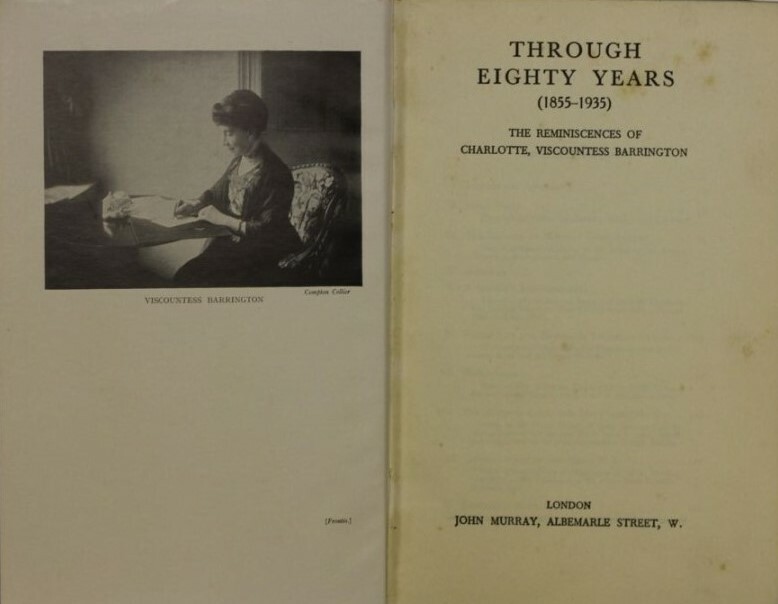 Whether Charlotte Richardson’s family witnessed the sermon or participated in the fasting is unknown. Charlotte herself was not yet born, arriving in the world in April 1781. She was baptised at St Sepulchre’s in June 1781 which is certainly not the nearest church to Wild Court. Perhaps the family did not at that time live there but we will never know. 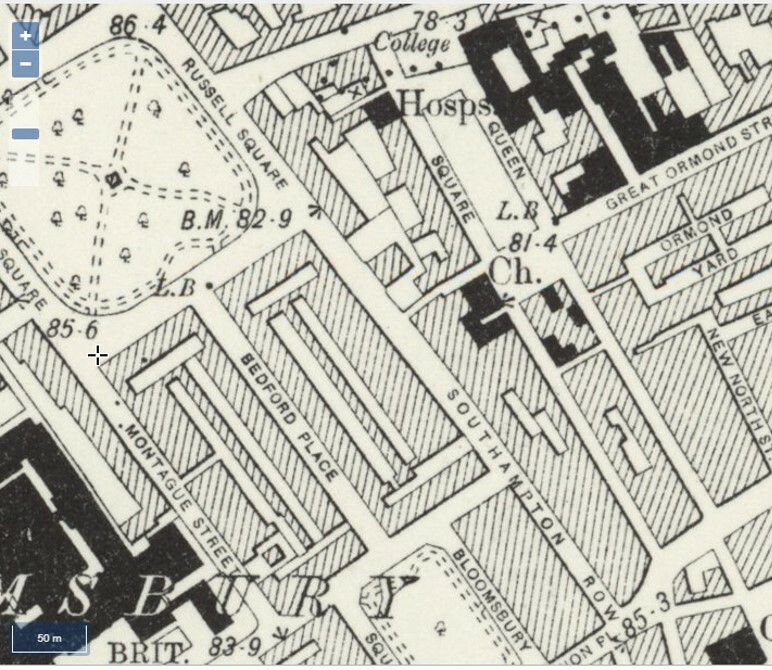 The map of 1889 from Charles Booth, Life and Labour of the People in London marks Wild Court as being an area of ‘Intermittent or casual earnings’. Although this is a century later perhaps the beginnings of these are evidenced in the entry in a Minute Book of 1788 which states that Charlotte’s father ‘was … formerly in good Circumstances but now much distressed’. The school records tell us that, having arrived at the School in January 1789, in February 1789 Charlotte’s name again appears in the Minute Book. The Matron being then called in and examined reporting Charlotte Richardson (one of the Children) who had been taken away by her Parents when she informed the Committee that her Father had been very troublesome and had insulted and abused her and afterwards the Mother came had took her Daughter away and notwithstanding the Child declared she was perfectly satisfied. Charlotte’s place was taken by Charlotte Hatton. Curiously, despite Charlotte Richardson’s parents being instructed to remove their daughter, her benefits withdrawn, the Book of Governors, published in 1818, records that she had been returned to her parents ‘in consequence of an alteration in circumstances’. As this was almost 30 years later, the edges of memory may well have been softened. But then Wild Court has fared better than either Black Swan Court or Flower de luce court neither of which exist any longer. 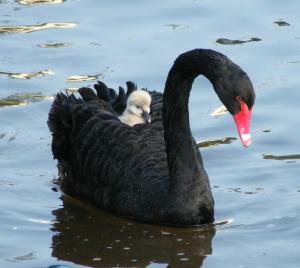 This image from https://haydensanimalfacts.com/2015/08/22/5-interesting-facts-about-black-swans/ has quite a high cute factor, don’t you think? https://www.british-history.ac.uk/no-series/dictionary-of-london lists at least four Black Swan Courts, plus one Black Swan Alley which had formerly been a court. 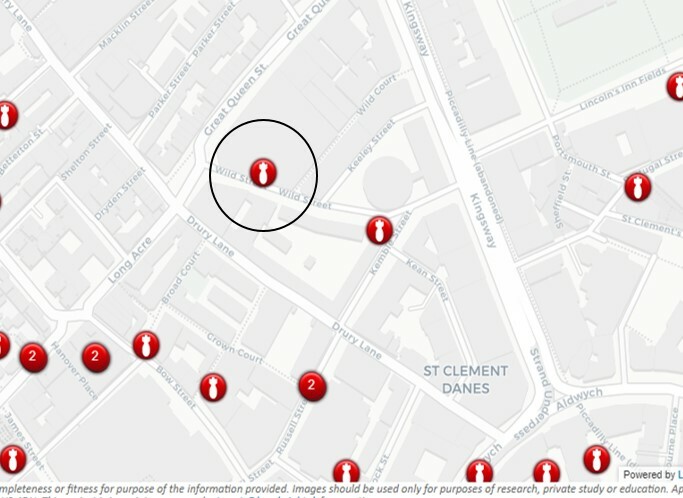 What is unclear is which of these is the Black Swan Court where Sibella Procter lived. This is largely because her address is given as Black Swan Court, Market St, a street that does not appear in earlier maps. We have already seen from Charlotte Richardson that the place of baptism of these early pupils may not be an indication of where they were living. In Sibella’s case, it is even more confusing because she was baptised at St John Zachary, a church which did not exist after the Great Fire! The parish was absorbed into St Ann and St Agnes and St John’s never rebuilt. Only its graveyard remains and its site is now a garden. Despite this, her baptismal record is clearly given as being at St John Zachary on Feb 14 1779. 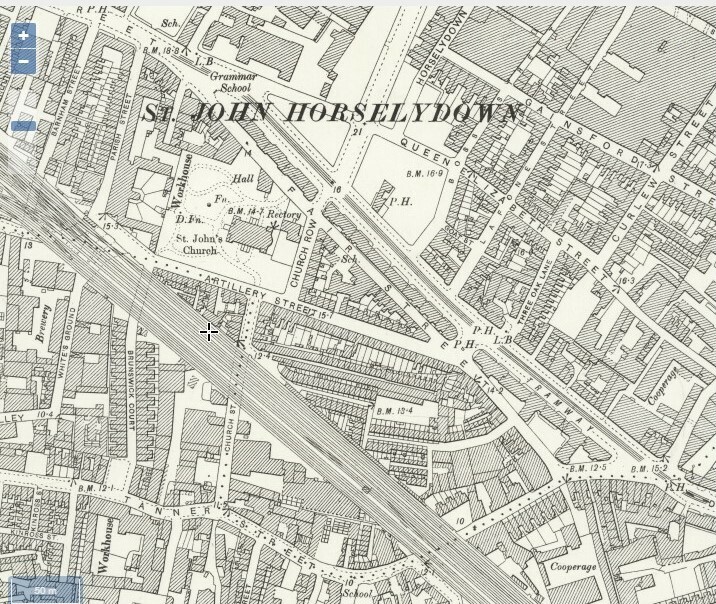 This 1883 street map of the St John Zachary area shows it labelled as a parish but with the site of the church rather than a church building. Earlier maps, from https://www.theundergroundmap.com/map.html?id=70&mode=fullscreen show the same areas in 1750. In neither case can Black Swan Court or Alley be identified but they may simply have been too small or insignificant to be marked on the map. When Sibella was admitted to the School, she was referred to as ’a very proper object’. This peculiar shorthand is inexact in meaning but as a rule of thumb a ‘proper object’ was a girl who had lost one parent and a ‘very proper object’ was a girl who had lost both parents. There is a reference to a Joseph Procter being buried Aug 20 1784 in St John Zachary which could be her father. There is also a marriage reference for 1767 at St Dunstan in the West, between Joseph Procter and Mary Wilkinson which might be her parents (or might not!) but further than this is difficult to trace. As for the girl herself, the School records state she was apprenticed to Mr Simons of Jermyn St, Soho Square. However, the 1818 Book of Governors lists her as apprenticed to Mrs Gonne, Champion Hill. Possibly she did both, moving from one to the other. Both could have been as domestic servants although there is a fleeting reference to Mrs Gonne running a school. In 1841, we find a Sibella Procter in Camberwell, aged 60, given as a schoolmistress. The 1841 census rounded ages up and down, so the computed birthdate of 1781 is within accepted parameters. It seems likely that this Sibella Procter (whether the one from School or not) died in 1845 and was buried at St Giles Camberwell. Our last candidate for the Court Report is Ann Martin whose address was given as No 3 Flower-de-luce-court, Fleet St. The spelling of Flower de Luce varied enormously (Flower de lys, flower de lyz or fleur de lys) and all were corruptions of fleur de lis anyway, from the quartering of the French arms with the English. The history of the fleur de lis armorially can be read at https://en.wikipedia.org/wiki/Fleur-de-lis from where the image is taken. 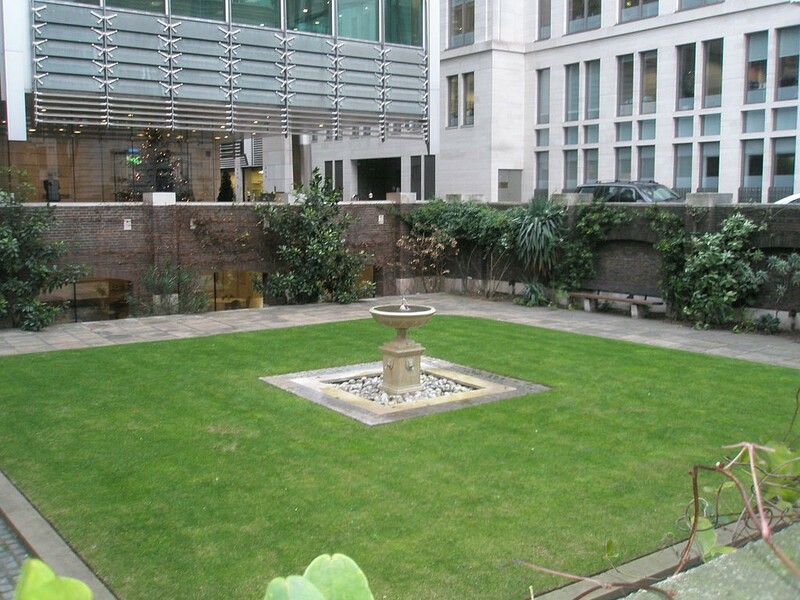 The likeliest candidate for the court that housed the Martins is Fleur de lis Court described as East out of Fetter Lane at No. 9, and north to Trinity Church Passage. 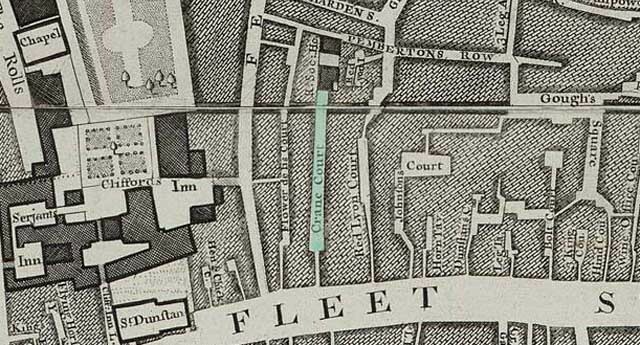 In the 17th and 18th centuries this was a long court extending south to Fleet Street, but when the southern end of Fetter Lane was widened, this southern portion was absorbed into Fetter Lane, as shown above. Nearby Fleet St is still synonymous with newspapers even though many prominent national newspapers have moved away. At one point, it was also a place for tanning which declined once the River Fleet was re-routed underground in 1766. Ann Martin’s father, Reeve Martin, is described as a glover which would fit with this. Given that the presiding rule for a girl to become eligible for the School was that of indigence, we should note that in 1784, Prime Minister Pitt imposed a tax on gloves. His calculation of the number of gloves that would be sold each year (9 million pairs) gave rise to a tiered taxation. The tax was payable by the retailer and in July 1785, The Stamp Office declared that: “Anyone selling gloves without this tax would be liable for a fine of £20.” (ibid). To ensure that duty was paid, every retailer had to be licensed. Unfortunately for Pitt, his careful calculations were somewhat over optimistic. By 1785, it was realised that it was raising less than an eighth of the revenue anticipated. Given the timing of this, it may well have been a contributory factor in Reeve Martin’s indigence and his daughter was elected nem. con. In 1788. The Minutes Book records that he was ‘Formerly in good Circumstances, now in great distress with a Wife and four Children’. It is possible that he is the person recorded in Newgate Prison, London: ‘Lists Of Felons (Prisoners) On The Common Side (Debtors)’ in 1786. The first pupils of the School all hailed from London (although later pupils came from all over the globe) but following their individual stories is hampered by an inconsistency in spelling of surnames and place names, seemingly entirely dependent on the clerk who wrote them at the time. For example, Sophia Kewney is written thus and also as Kenney and it is not certain which, if either, is correct. Catherine Charlotte Baes was actually baptised under the name Boyce – or possibly Bayce – and both might be intended to be Base or Bays anyway! Mary Ann Wolveridge’s address was given as Melliore St, Maize, Southwark which doesn’t take much research to discover is Melior St, Maze. So trying to locate their addresses as given when they were admitted to the School in 1789 does have a degree of jeopardy attached. 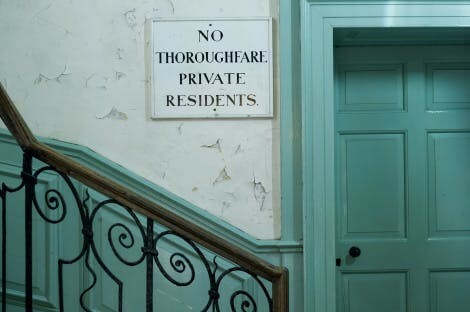 This series of posts attempts to trace the addresses and has been divided into Bloomsbury, City, East End, Marylebone, Soho and Southwark based solely on what is written in the register at the time. 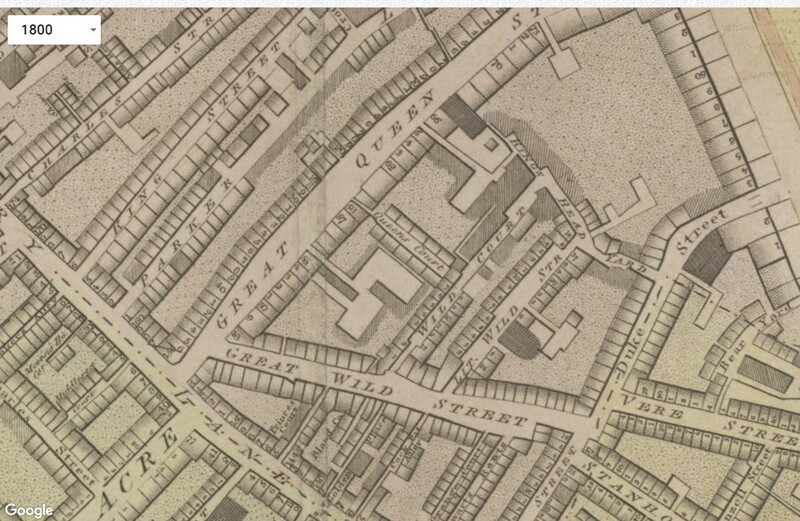 Some of the addresses have disappeared since the eighteenth century and most have changed beyond recognition even if the original streets are still there. The School began in premises in Somers Town but the girls hailed from central, east, west and south London so arguably represent a microcosm of London life. We will begin with Bloomsbury for no other reason than two of the first pupils lived in the same street. It would be most intriguing to know if they knew each other before they came to the School but it is unlikely that this will ever be discovered. 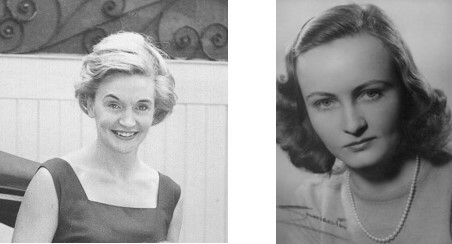 Elizabeth Lowe and Sarah Jane Sitgraves both lived in King Street, Bloomsbury. (Sarah Jane is a case in point for clerical errors as her surname has been written variously as Sitgrave, Sitgraves and Sitgrace. As Sitgraves appears with greater frequency that is the version that will be used.) The Sitgraves’ residence is given as Upper King St if we are splitting hairs, but in any case King St isn’t King St any more so the distinction is academic. However, today it is known as Southampton Row although the jury is out about whether this is the whole of King St (as was) or just a part of it. 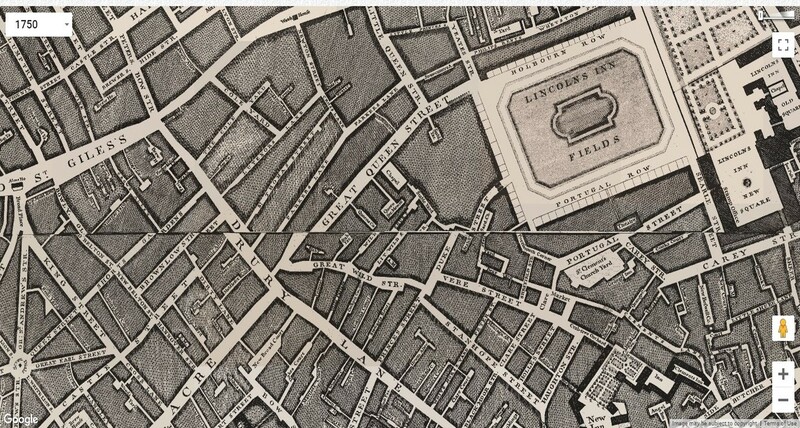 On Rocque’s map of 1746, it is labelled as King St, although he also calls the whole street as far as Bloomsbury Place ‘King Street’ and does not distinguish between King St and Upper King St. 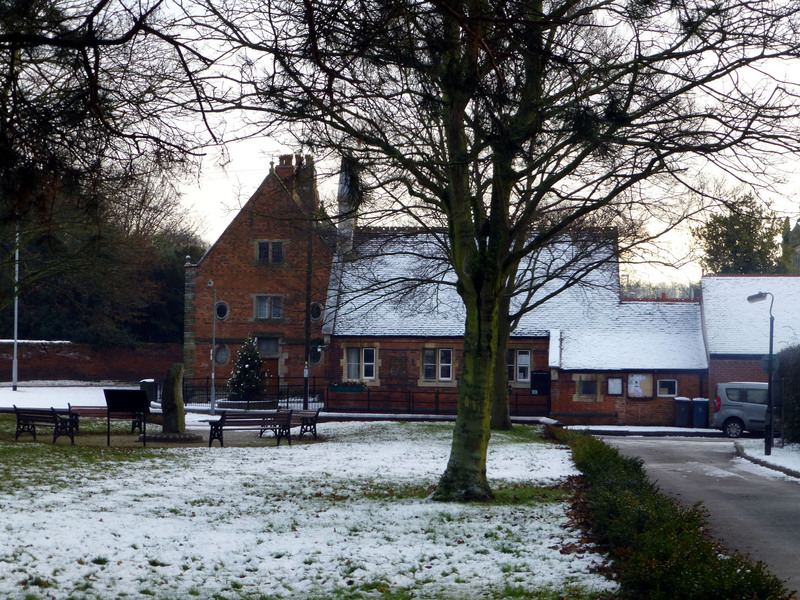 It lay on the western edge of the Bedford estate whilst the first site of the School was described as ‘north of the Duke of Bedford’s’. The streets were named after the Earls of Southampton whose land this was until 1667 when Lady Rachel Vaughan, née Wriothesley, daughter of the Earl of Southampton, married William, son of the 5th Earl of Bedford and the Bloomsbury area became part of the Bedford estate. 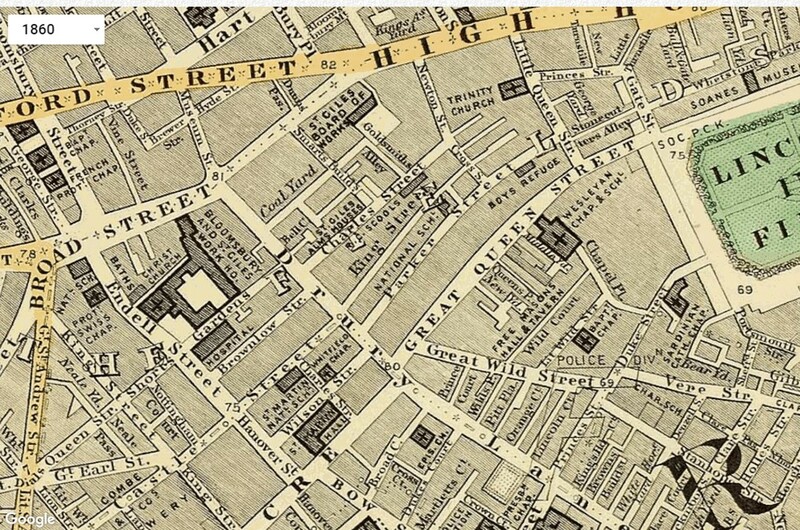 By 1897, the whole street became known as Southampton Row and it is shown thus on a map of this time. An earlier map (Horwood’s 1799) shows on the east side of the street, consecutive numbers from 1 to 33, running from south to north with no numbering on the west side. The numbers are irrelevant for Elizabeth Lowe’s address, which is given only as Taylor, King St. Her father is described in the School register as ‘Formerly a respectable Master Taylor now in great distress with a sick Wife and two Children’ so we have to assume that he is the tailor (as we would spell it today) of the address or, at the very least, worked for the tailor. Sarah Jane’s place of residence was Bedford Head, Upper King St. and we know her father was a victualler so it comes as no surprise to find that there was a PH called Bedford Head. The Bloomsbury Project lists 19 pubs in the area from the 1832 Robson’s directory of which the Bedford Head is one. https://www.ucl.ac.uk/bloomsbury-project/streets/tottenham_court_road.htm So plenty of watering holes for the working man to quench his thirst. Pubshistory.com very kindly identifies the number as 5 Upper King St https://pubshistory.com/LondonPubs/StGeorgeBloomsbury/BedfordHead.shtml and gives the publican in 1805 as Richard Gascoigne (Holdens Directory). This is the earliest reference on this website to which we could now add Edmund Sitgraves in 1789. Edmund died possibly in 1802. There is a burial record but not really in the right place and, additionally, he was described as deceased in 1794 when his son Thomas was apprenticed. 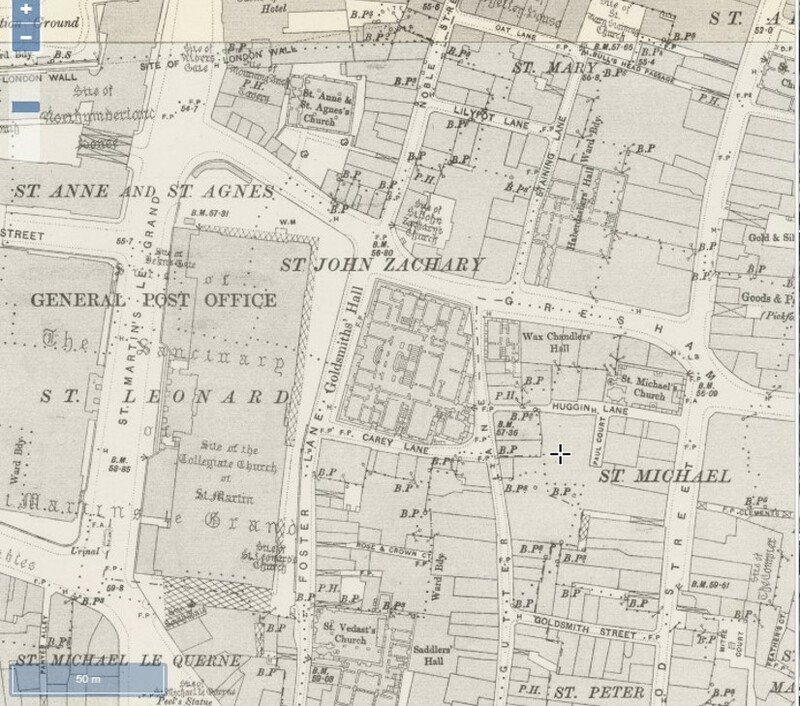 The wonderful website https://maps.nls.uk/geo/explore/side-by-side/ shows Southampton Row both today (heavily encroached upon by Kingsway in 1905) and how it was in 1895. Whilst there have clearly been many changes, the bones of the eighteenth century places can still be seen. The original 112 acres acquired by the Earl of Southampton after the Dissolution of the Monasteries has been reduced to twenty acres (Survey of London, vol. 5, 1914; Shirley Green, Who Owns London?, 1986), but it bears names that forever identify it with those origins. It is probably safe to say that it is unlikely Elizabeth Lowe or Sarah Jane Sitgraves ever considered the name origins of where they lived before they became pupils at the School. After their time at the School, Sarah Jane returned home to her mother and may possibly (uncertain) have married John Robyns in 1820 and died in 1825. Elizabeth Lowe, on the other hand, who left in 1797, was apprenticed. She was originally due to be apprenticed to ‘Captain Thomas Meriton, of St Catherine Cloysters, nr the Tower’ but the School records that she was ‘Apprenticed, by her own wish, to Colonel Jackson, Titchfield St’. Why it was Elizabeth’s wish to be apprenticed to one and not the other (both probably in a domestic servant capacity) is unknown and neither is it recorded the reaction of the School authorities to her declared wishes. One can, however, imagine the row that ensued! The way this is written would suggest that the Captain Thomas Meriton is a ship that undertook a regular return trip between London and Calais. On the other hand, there was definitely a sea captain called Thomas Meriton as identified in The London Magazine, Or, Gentleman’s Monthly Intelligencer although, as this reference was to his death in April 1766, this cannot be the same one. St Catherine’s Cloisters is described in Lockie’s Topography of London (pub. 1810) as being in Tower Hill on the north side of the church. Now written as St Katherine, it is the site of St Katherine’s Dock, the original hospital founded in 1147 by Matilda subsumed. 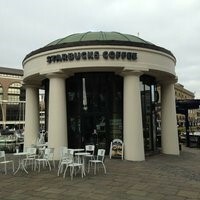 There is still a Cloister Walk however where a certain coffee house can be found. 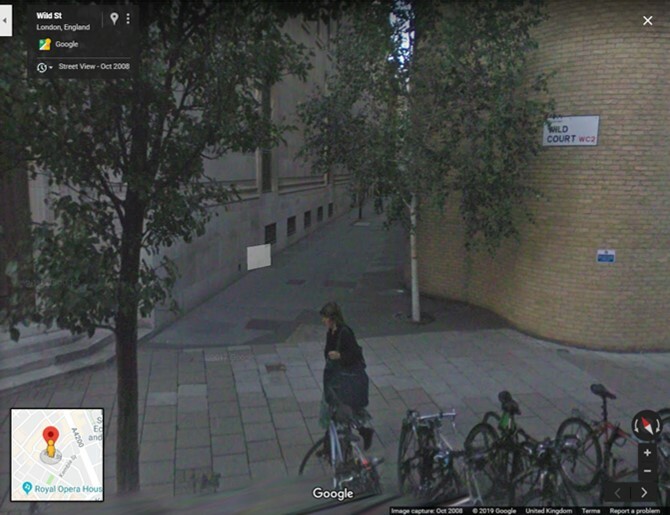 Titchfield St (or Great Titchfield St) on the other hand is not at all far from Elizabeth’s family home in King St. So perhaps her motivation was the very understandable one of being near home or family. There is a possibility that she married William Phillips in 1803 but, like the possible marriage for Sarah Jane, there is not enough certainty to state this is definitely the case. For both girls, until other information comes to light, their lives float off into the middle distance. From Bloomsbury to beyond! We last left Rickmansworth Park in the possession of the Ardens (https://rmsghistoryextra.wordpress.com/2018/12/10/walk-in-the-park/) as an occasional residence with London the primary residence. Joseph Arden was a barrister of the Court of King’s Bench, the court of law for cases of bankruptcy. King’s Bench Prison took its name from this court and is where Mary Fotherley-Whitfield had ended up with debts arising from Park House. Julia Arden was Joseph’s elder daughter and had married John William Birch, of Mildred, Goyeneche and Co, Spanish merchants of London. He later became a Director of the Bank of England (Deputy Governor, 1877-79; Governor, 1879-81). When Julia’s father died, she and her husband purchased Rickmansworth Park from his estate. Perhaps they were the ones who lived there most often. Or it could be that the eldest Arden son, as presumed legatee, was a bit short of the readies and offered the estate to his brother-in-law in return for a lump sum. Whatever was behind the transaction, Rickmansworth Park became the property of John William & Julia Birch. After his death, she inherited it and later bequeathed it to the widow of her eldest son. But we are getting ahead of ourselves here so let us go back to 1879 when Joseph Arden died and the Birches took on Park House and the estate. 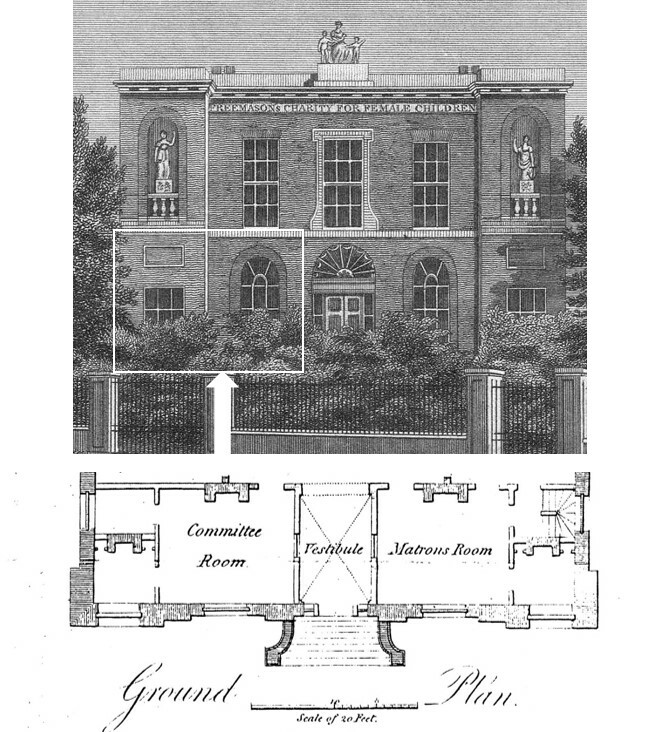 Rather as his father in law had done, John William Birch used Rickmansworth Park as a country residence as his address is given as 27 Cavendish Square. Interestingly, this is now the site of the RBS bank so it has moved from being the residence of a Governor of the Bank of England to the residence of a bank. In 1881 the Birches’ eldest son, John Arden Birch, married Charlotte Mary Leycester Stopford and Cavendish Square is given as his residence. However, it is her residence that is interesting here: Hampton Court Palace. Why Charlotte Stopford’s family had an apartment is unknown. Although her mother was widowed young with three small children, her husband, Major George Montagu Stopford, is not noted amongst the King’s loyal servants. 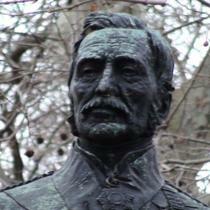 However, Charlotte’s grandfather, Field Marshal Sir John Fox Burgoyne, was. ‘From his first entrance into the army , John Burgoyne commenced a career of active and laborious service, which continued without intermission for the extraordinary period of seventy-one years.’ https://www.gracesguide.co.uk/John_Fox_Burgoyne. He was given the title of Constable of the Tower of London and Lord Lieutenant of the Tower Hamlets in 1865, the first commoner ever to be granted these titles. He was in full vigour until he was 88 years old when his only son died after the vessel of which he was captain capsized in a storm and all but 19 sailors were drowned. Thereafter, he went into a decline and died within a year. Despite the acres of print about his remarkable career, there is no reference to him being given the use of a grace and favour apartment at Hampton Court Palace but it remains a possibility that this is why his granddaughter lived in one and, according to her own autobiography, Through Eighty Years, had done so since she was a child. It is worth noting that, although the ‘residence’ of Hampton Court Palace is given on several documents, none of the census returns ever place either Charlotte Birch nee Stopford or her husband there, even though his burial record again gives his residence as the Palace. But then, if you are entitled to give a palace as your address, why not trot it out at every opportunity? Especially if doing so enables you to marry in what was once upon a time a very exclusive venue – Hampton Court Chapel Royal. John and Charlotte had five children, three sons and two daughters; Dorothy, John, Cicely, George & Francis (Frank). There is an outside chance that this last born had a different kind of connection to the School but that’s the way coincidence works. As an adult, he was a cryptographer with Naval intelligence in both world wars. He joined the Naval section at Bletchley Park in September 1939, and was involved in work on the enigma code. And the connection to the School? Well two former pupils also worked at Bletchley Park at this time: Violet Elsie Geddes-Ruffle, also assigned to naval Intelligence as an 18 year old ‘Wren’, and Pamela Mary Lidstone, Block B. Naval Section. NS IV, Japanese codes. Whether these two ever encountered each other, or Frank, will never be known. Frank was only three when his father suffered a catastrophic stroke that rendered him paralysed for the remaining four years of his life. 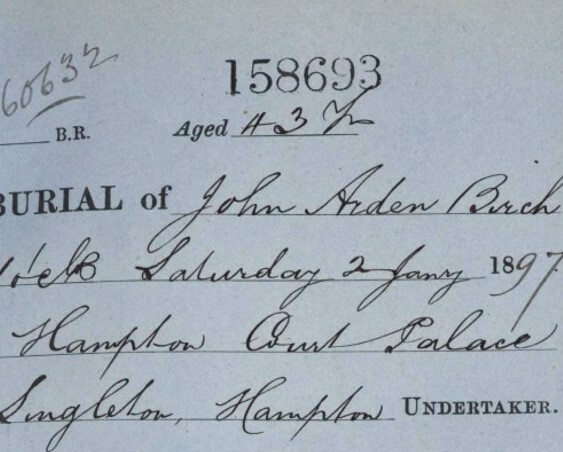 John Arden Birch died in 1896 and his father (John William Birch) was so utterly devastated that he also became very ill. To aid his recovery, he took a break in the South of France. On his return, however, he stayed overnight in a hotel and there died of a gunshot wound to the head. The coroner stated that, whilst it was clear that this was self-administered, it may have been accidental and he therefore allowed the death to be recorded as this. It should be remembered that until 1961, suicide was regarded as a criminal offence. Anyone who attempted and failed could be prosecuted and imprisoned, while the families of those who succeeded could also be prosecuted and the estate taken by the Crown. In allowing an element of doubt, the coroner was allowing the Birch estates to be inherited rather than being confiscated. His effects of £65,330 remained in the family and Julia inherited Rickmansworth Park. She remained in residence until her death although, as before, ‘residence’ did not always mean she was physically there! It is a moot point whether she was there in 1911 when a murder took place in the Park. Rosa Gurney, a widow, was walking there with a man friend. Quite what happened is known only to the two of them – there being no witnesses– but she was stabbed a number of times and subsequently died. The Police next day arrested the man who (natch!) declared himself to be innocent. He claimed that, whilst walking, they had met two other men, Rosa had started talking to them and he got fed up waiting for her and left. Smacks rather like ‘a big boy done it and run away’ and clearly the Police thought so too. The bloodstains found on his clothing were the clinching factor and he was arrested. Lord and Lady Barrington lived at Becketts in Shrivenham, Berkshire, the house now being part of Cranfield University. 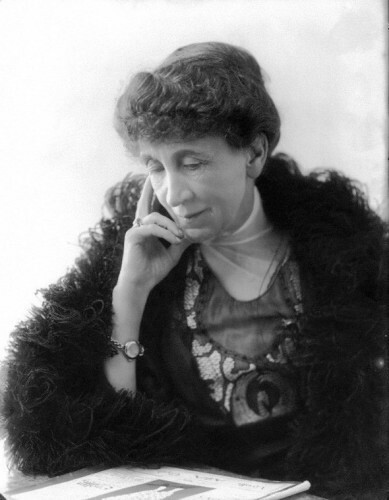 Here, Viscountess Barrington undertook the role of lady of the manor. Rickmansworth Park was put up for sale by auction. It failed to meet its reserve price but it remained on the market until the School opened negotiations. These were protracted and it was a case of who blinked first. The School had the property independently valued (£45,000); it was advised that £50,000 should secure it but Viscountess Barrington was holding out for £70,000. Eventually, after much discussion, a figure of £65,000 was agreed with the curious stipulation that Lady Barrington could remain in residence until building began. Curious because, by all accounts the house was being looked after by a caretaker couple. And yet, in the School archives, letters between the School and Lady B clearly show her address as Park House. But then, when you have a multitude of houses at your disposal (there was also property in Ireland), you can use which of the addresses you like as and when it suits you! The conclusion of the sale of Rickmansworth Park ended the Arden family’s connection with the estate after almost a century. Park House would, in due course, be demolished and the School begin its tenure. That in turn is rapidly approaching its centenary – the purchase of the estate in 2026 and the transferring of the School from its former home in London in 2034. This, the last posting of the Stothard sequence, contains four names of import: Ten Broeke, the Earl of Moira, Lord Rancliffe, and the Stadtholder. This tight little group, standing immediately behind the Prince Regent (Dr Boyes makes up the quintet) tells its own story about perceived importance in the eyes of Stothard. Or possibly, if the portrait represented a single event, how they perceived their own importance at the time. If this were a sort of historical photograph, their positioning by design or a degree of elbow-jostling infers a status on the individuals. The closer you were to the future king at an event might indicate how close you were to the future king. The positioning is highly likely to have been choreographed in a real event. If it were a composite image of a number of similar events, quite possibly Stothard was instructed where to place people. On the other hand, the darker colours are enhanced by the splendid scarlet of the uniform jacket so for artistic licence it works. We are not party to all the preparation for event or image so we can only speculate whether deeper meaning can be read into this grouping or not. Anthony Ten Broeke was certainly important in the School’s history. 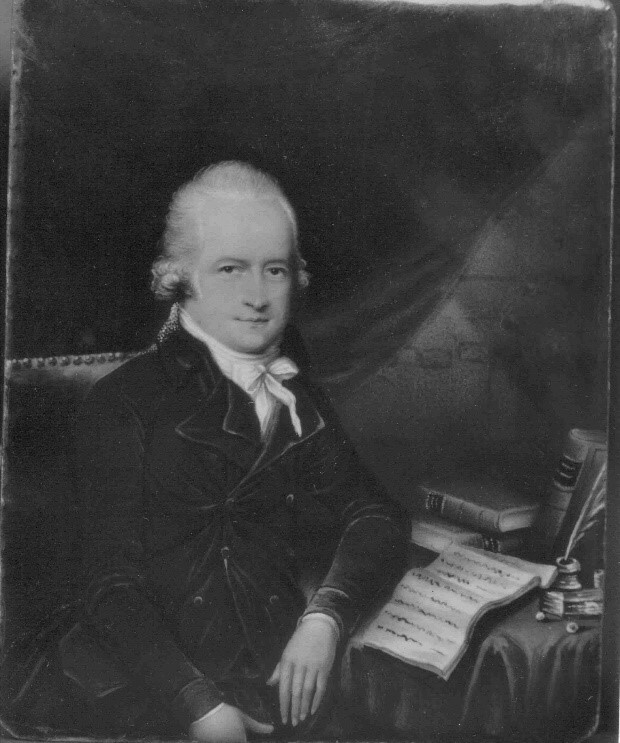 A founder of the Caledonian Lodge, Ten Broeke was also one of the nine freemasons who established the Royal Cumberland Freemasons’ School in 1788. Born in 1736, he would have been in his prime at the time. His surname is Dutch in origin and until very recently there was a serving Dutch politician of that name: Hans Ten Broeke. The surname appears to derive from ‘on the marsh’ – a broeke is a marshy area or a creek and, of course, is linked to the English word ‘brook’. So Anthony Ten Broeke would be Tony Marsh or Tony Brook perhaps. This portrait of him is in the Library of Freemasonry having been presented in 1938 and since restored. It portrays him as Master of the Caledonian Lodge which he became in 1766.
so meetings no longer had to be held in coffee houses etc. 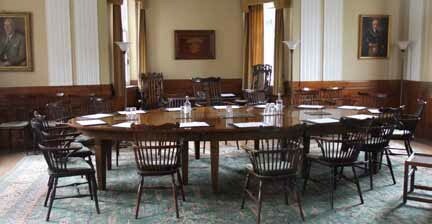 Said committee room required furnishing so the lodge presented to the School a fine set of 25 chairs which can still be found at the modern day School. 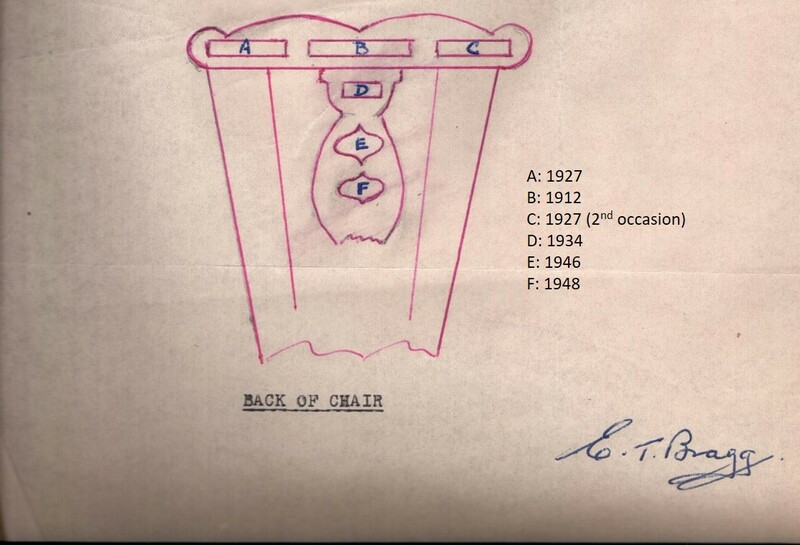 One of these chairs, known as the King’s Chair, is the one used by any visiting royalty and has a label attached to it identifying the occasions when it was thus used. Anthony Ten Broeke left a masonic dynasty in the lodge, with the Master in its 250th year, Graham Ten Broeke, continuing the family tradition. Indeed, a celebration was held at the School to mark this occasion as an indication of the longevity of the association. Ten Broeke died in 1812 and is buried in Austin Friars Churchyard (Nederlandse Kerk Londen) in the North Aisle. 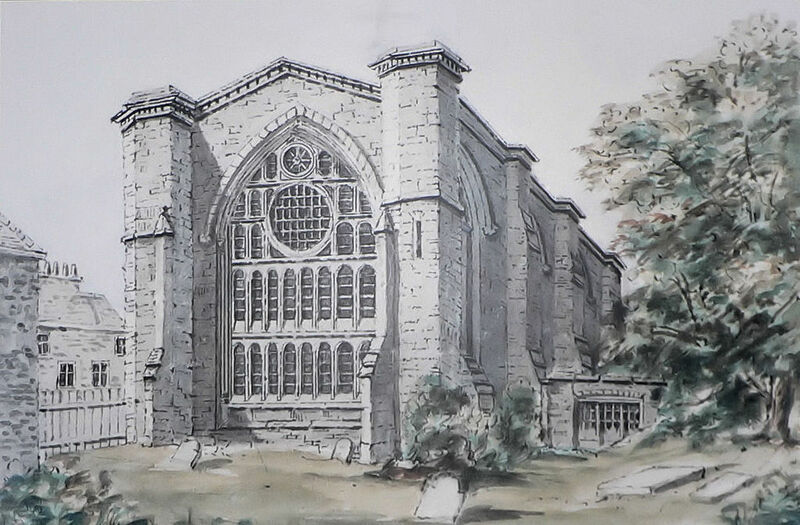 This church was destroyed by fire in 1862 and its replacement destroyed in the Blitz. The current church on this site was built in the 1950s. The Earl of Moira also has a connection with the School that goes beyond the individual depicted by Stothard. When the School moved to its current site in 1934, the eight boarding houses were given names that reflected the School’s history. One of those names was Moira. 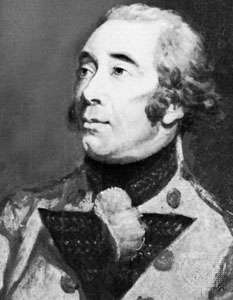 Francis Edward Rawdon-Hastings, 1st Marquess of Hastings, was known as The Earl of Moira between 1793 and 1816 – so whichever of the dates we select for the Stothard portrait, he was the Earl of Moira in it. He had served with British forces during the American Revolutionary War and in 1794 during the French Revolution, hence his depiction in military uniform. He married late in life (he was fifty at the time) and, as this was on 12 July 1804, he was single at the time of the portrait. He and his wife, Flora Campbell, Countess of Loudoun, had six children. It would appear to have been a love match as, after his death at sea off Naples in 1824 and following his earlier directions, she arranged for his right hand to be cut off and preserved, to be buried with her when she died. He had been serving as Governor of Malta and had been on board the ship to return to his wife when he died. 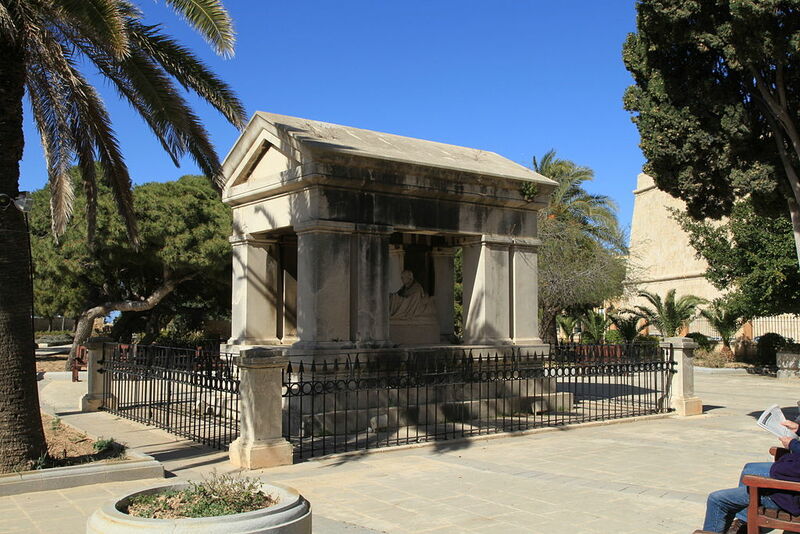 His body was laid to rest in Hastings Gardens, Valletta which is named for the Earl. His hand was eventually interred, clasped with hers, in the family vault at Loudoun Kirk. 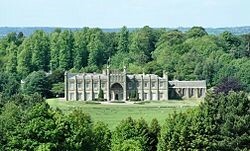 He had inherited Donnington Hall from an uncle and then had it rebuilt in a Gothic style at about the date of the Stothard portrait. Requisitioned at the start of World War I by the British government and turned into a prisoner of war camp, it is now the headquarters of the Norton Motorcycle Company. 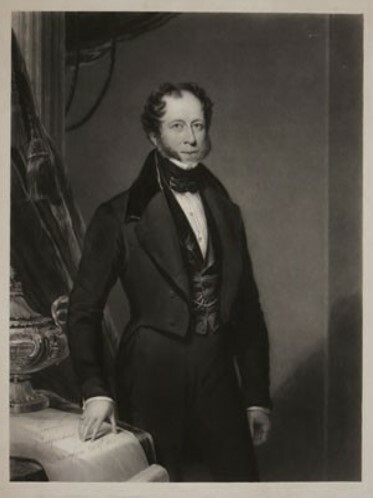 Lord Rancliffe, placed under the guardianship of the Earl of Moira when his father died, was George Augustus Henry Anne Parkyns (1785-1850). 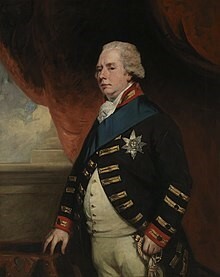 He was given his first two forenames in honour of his godfather, later George IV. So his position in the Stothard portrait is explained by his connections to both the Earl of Moira and the Prince Regent. Strictly, however, he should not have been referred to as Lord Rancliffe in the portrait as he did not succeed to the baronetcy until 1806. 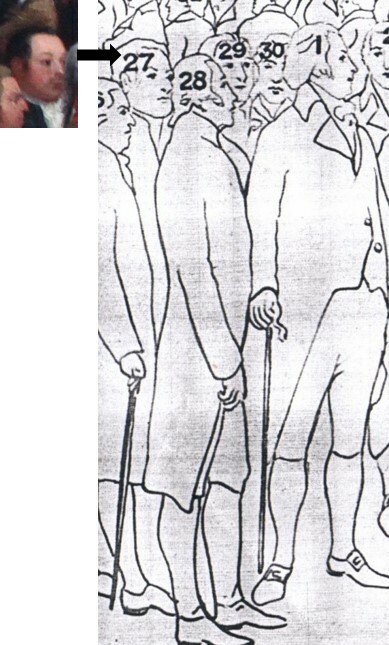 However, the Right Hon The Lord Rancliffe is how he appears on the outline image. On his 21st birthday he came into his inheritance which included an annual income of £21,000. A sum not to be sniffed at now, it was the equivalent of £5.5 million in today’s money. 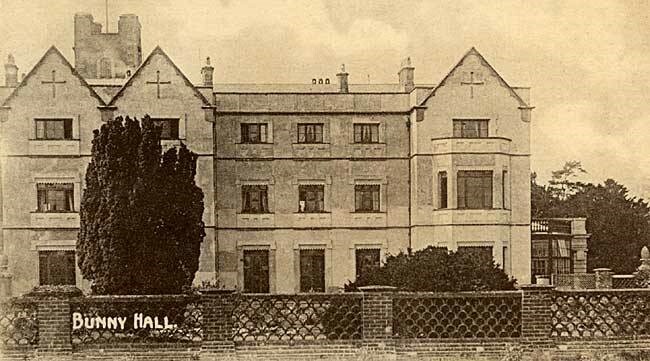 He also inherited the delightfully named Bunny Hall in Nottinghamshire which had been in the family since 1574. Actually, the name Bunny is nothing to do with cute furry creatures but is derived from Old English Bune, meaning reed. In White’s Directory of Nottinghamshire, 1853 it is spelled Bunney. In October 1807 – so still a very young man – Rancliffe married Lady Elizabeth Mary Theresa Forbes, daughter of the Earl of Granard, and also niece to the Earl of Moira. The marriage was not successful and they separated, although did not divorce. He returned to Nottinghamshire (from Paris) and there he made the acquaintance of Harriet Burtt. At that time, she was married to a GP, considerably older than she, who was confined to an asylum. Harriet became resident at Wymeswold (Leicestershire), under Rancliffe’s protection, and then later went to live with him at Bunny. Eleven years later, the will was contested by his brother-in-law but to no avail. Harriet Burtt was left in full enjoyment of the estate which at the time had an income of £7000 a year (equiv. of about £250,000 today). 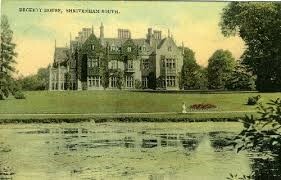 Mrs Burtt bequeathed the estate to her niece, Arabella Hawksley, who married Mr Robert Wilkinson Smith in 1898. When Robert died, he left the greater part of his large fortune for the benefit of Nottingham’s poor widows and spinsters. Our final member of the Stothard group is His Serene Highness, the Stadtholder, or William V, Prince of Orange. The use of the word ‘Serene’ here is to mean supreme or royal rather as ‘Sublime’ (Ambassador to the Sublime Porte) meant principal. Queen Mary, who opened the School on its present site, was born ‘Her Serene Highness Princess Mary of Teck’ but during WWI, George V revoked recognition of this style of title for members of the family living in Britain. William was the last Stadtholder of the Dutch republic. Born in 1748, he went into exile in London in 1795 under the title of Prince of Nassau-Orange. On his death in 1806, that title was inherited by his son William, who returned to the Netherlands in 1813 and became the first Dutch monarch from the House of Orange (William I). As a European royal, it does not come as a surprise to find that William V was related to the Prince Regent as he was George III’s cousin. The title Stadtholder is roughly comparable to England’s historic title Lord Lieutenant and was elected rather than inherited. However, In 1747 the office had been made hereditary. William IV was the first of these and William V the last. However, what would have been William VI, the Stadtholder, became instead William I, the first King of the Netherlands. His direct descendants still hold the title (currently Willem-Alexander). We began this little group with one person of Dutch descent and, rather neatly, we end with another. The portrait, so familiar to the School, has taken on a new life in the identification of many of the people portrayed in it. It is now not just Ruspini leading the children before assembled Freemasons but represents a moment in time recorded for future generations to witness the extraordinary breadth of support the School received. The trouble with a big portrait is that it takes a lot of words to write about all the people in it. Or at least all the people named in it as there are several score of folks not identified at all. Even of those named, there is not always much to say because they are research-shy. Clearly deemed important enough to be named in the portrait, nevertheless Wm Williams, Mr Pride, Rev Archer Thompson, Rev Mr Lucas, Mr Humpreys [sic] and Mr Harper must all remain merely as names until any further information is recovered. Dr Boys – who was certainly at one point the Hon Surgeon to the School – is one John Boys who lived in South Molton St and was a member of Somerset House lodge. But that’s about it for the biographical information. His placement in the portrait in relative proximity to the Prince of Wales perhaps infers importance but the lack of information about him tells another story entirely. Fortunately the ole internet has been more forthcoming about other names. Let us begin with name which seems surprising amongst the rest: ‘General Bowles, Cherokie Chief’. Disappointingly not portrayed in a splendid First Nation headdress, John Bowles is an interesting personage to have been included at all. Chief Bowles and the Texas Cherokees (Mary Whatley Clarke, 2003) does not include any reference to his having travelled to England at any point. Born around the middle of the eighteenth century, Chief Di’Wali was also known as John Bowles or ‘The Bowl’. His parentage is believed to have been a trader from Scotland or Ireland and a Cherokee woman. He was described contemporaneously as ‘an auburn haired, blue eyed half blood Scottish Cherokee’ (Whatley citing History of the Cherokee Indians by Emmett Starr). It was claimed that Bowles’ father had been killed by white settlers when Bowles was a boy, and that the son killed his father’s murderers in revenge when he was fourteen. A biography of him (https://shannonselin.com/2015/12/cherokee-indian-chief-bowles-duwali/) states that he could neither read nor write and did not speak English, which makes him an even more curious figure to have been at whatever occasion Stothard was portraying. He became the Chief of the tribe in 1792 when they were in Tennessee but in 1794, Bowles was involved in an altercation which became known as the Muscle Shoals massacre. Various accounts of this exist but none quite agree with any others about who started it. The outcome was that the warriors fled to Missouri and the rest of the Cherokees followed after. Following an earthquake in 1811 – which was interpreted by them as the Great Spirit telling them to leave the area – they moved into modern-day Arkansas. Unfortunately they chose land which had not been included in the treaty with the United States as that belonging to the Cherokees. So they moved again. Now the question we have to ask is – if General Bowles had been involved in a murder in 1794, why was he present at an event that appears to have taken place not long afterwards? And if he was ‘on the run’ in the United States, or at the very least, forced to move territory, what on earth would he have been doing in London at all? None of the accounts of his life refer to his having been in England but, equally, none of them say he wasn’t there either! And even if we accept that he might have skipped across the Pond until the heat died down, is he the sort of personage who would be welcomed in the presence of royalty? On the other hand, the Chickamunga Cherokees, of whom John Bowles was Chief, had supported the British in the American Revolution so maybe he was in London to receive thanks? Some interesting conundra here. Could it be that, like the reference to Mr Haydon which may have been wishful thinking on Stothard’s part, the Cherokee Chief was not there at all but Stothard thought him a colourful character to include? There is arguably some cachet in including Benjamin Haydon as it confers a quality on the painting which is subtle but can be read by them what know. But a Cherokee Chief with a tarnished reputation? More questions than answers, I fear. In 1799 he was appointed a Grand Steward and served as President of the Board of Grand Stewards. The same year he joined the Grand Stewards’ Lodge. 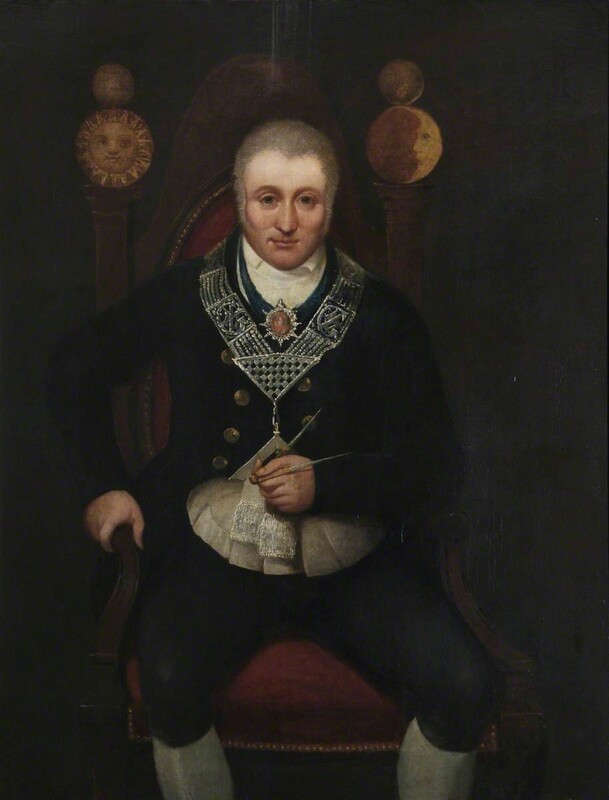 In 1796 he had been appointed Provincial Grand Master of Essex, a position he held until his death in October 1800. In addition to this, he was Senior Lieutenant in the Light Horse Volunteers and as a pastime he wrote Greek verse, which seems to have stemmed from his time with Dr Parr who was a great admirer of Greek literature. 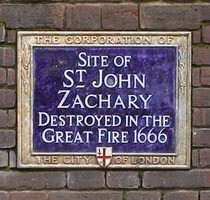 There is a monument to him in St Paul’s, Covent Garden, often known as the actors’ church. Among those buried at St Paul’s are Samuel Butler and the woodcarver Grinling Gibbons who did much of the carving, fortunately saved from a disastrous fire in 1705. Next to Downing is John Jeffryes, and for him we are back to the printing trade. He is given as a printseller of 18 Ludgate Hill (Bull & Jeffryes) and afterwards in Clapham Rd (1802-1804). There is also a William Jeffryes identified with him in Ludgate Hill but whether this is a brother or father or, indeed, no relative at all is unknown. Perhaps he was known to George Downing as he is pictured by Stothard seemingly in conversation but somewhat coyly with his back to us. 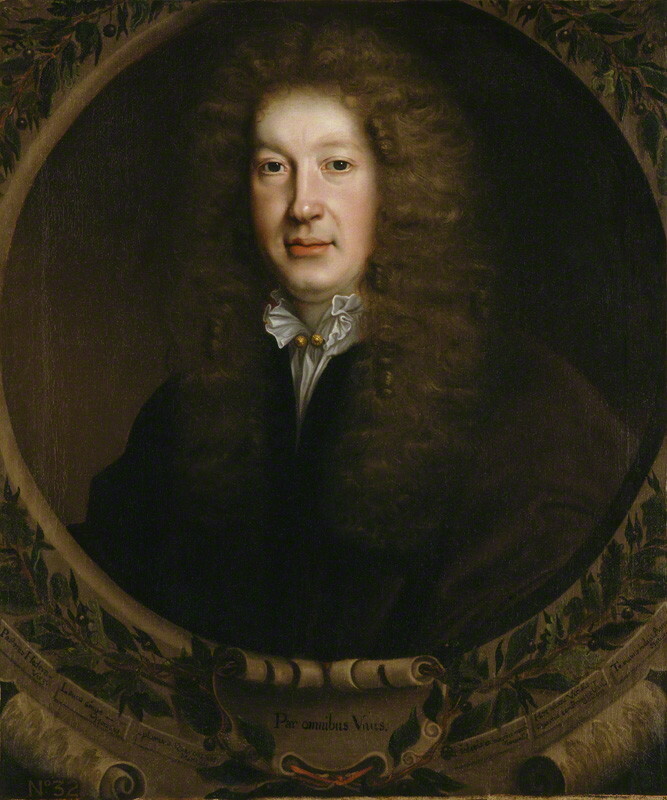 Although there are sixteen references to him in the National Portrait Gallery, it is always with him being given as publisher and never as a subject so we are none the wiser about whether Stothard has captured his likeness. The British Museum holds one of Jeffryes’ trade cards but this does not contain an image of him either. It would appear that the Stothard portrait may be the only glimpse of him and we can hardly make out any features. But then, we are using a portrait designed in one way for another purpose. We are reading across the artistic grain. Would Stothard have approved? Who knows.